This country’s made for road trips, and crossing South Australia’s vast Nullarbor Plain is just about as iconic as they come. Settle in for a 10 day journey from Adelaide to Perth – from Red Gums to sand dunes, dolphins splashing in the water to kangaroos sunbathing on the beach, endless deserts and ancient forests, this trip will show you we mean it when we say Australia is packed with diversity. This is also your chance to get up close to that famous Aussie native wildlife – kangaroos, wombats, emus and rare birds in remote natural parks – and enjoy iconic bush scenery. Head up through southern Western Australia for a drop of Margaret River wine country and finish up in Perth – whichever way you look, this wild, nature-filled land will knock your socks off. If there’s one thing Australia does well, it’s big things: the Big Pineapple, the Big Banana, the Big Merino… the list goes on. Keep your cameras at the ready for the lesser-known Big Galah, an eight-metre-high fibreglass structure overlooking the gift shop in the tiny town of Kimba. After a quick pit stop for lunch, it’s back on the road to Venus Bay, Talia Caves and the Lake Newland sand dunes . In the afternoon we’ll pull in to Coodlie Park for a night’s stay on a working farm. 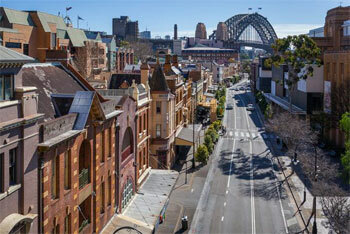 Just up the road from Coodlie Park lies Baird Bay, an environment famed for its watery wildlife. This morning you’ll get the option to swim, snorkel and splash about with playful sea lions and dolphins on a 3-hour cruise. 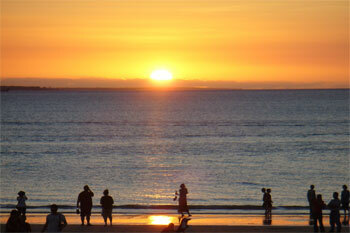 This outsource adventure done by Baird Bay eco tours is an optional experience. Following a picnic lunch on the beach, we’ll continue driving along the coast to our secluded camping spot in Fowlers Bay. Today we drive approx 5 hours, in total with stops along the way. Days don’t get much more Australian than this one. 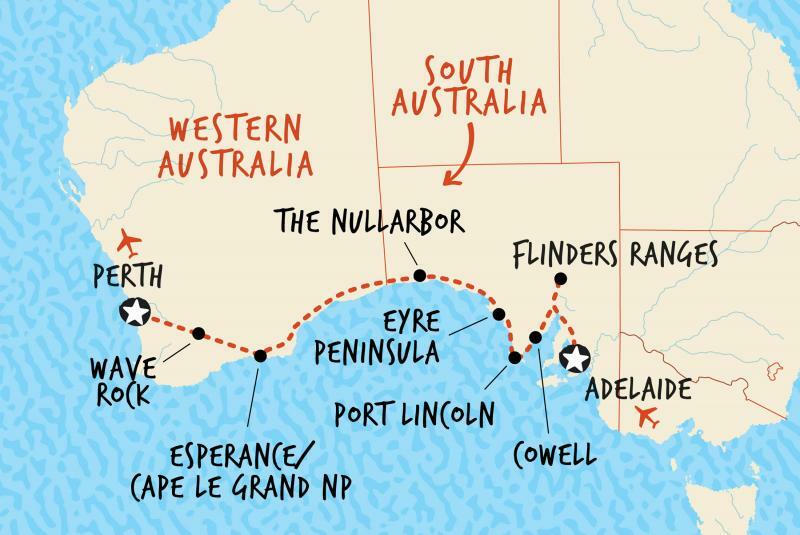 Not only do we cross the 5,320-kilometre-long dingo fence this morning; we also take a snap or two at the famous wombat, emu, camel road sign on the Nullarbor and stop off at Bunda Cliffs to see where Australia, quite literally, drops into the ocean. Come arvo we cross the border into WA, where tonight’s free entertainment is provided courtesy of the celestial sphere. With their planetary sounding names and strewn about space junk, the small towns of Balladonia and Norseman have a slightly intergalactic atmosphere about them. Balladonia shot to worldwide fame in 1979 when the Skylab space station returned to earth here rather abruptly. Continue the drive to Esperance, which may seem like a bustling metropolis after five days in the desert. 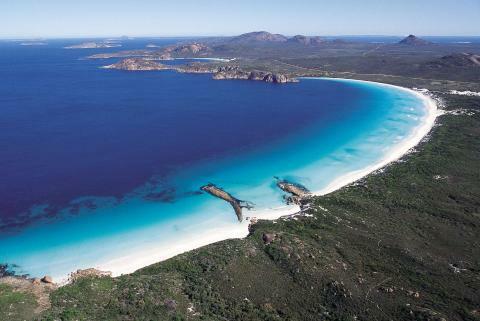 Crystal clear waters, powdery white sands, expansive granite bluffs… and sunbathing kangaroos? If you choose to start today with an early morning beach stroll, don’t be surprised when you come across a roo or two lounging on Cape Le Grand’s stunning shoreline – they know what’s good for them. How you spend your day here is wholly up to you: set out on a coastal bushwalk, splash about in the sea, fiddle around with your camera aperture or just kick back with your new buds along the beach. Unless you decide to stay in your tent all day playing Tetris, there’s really no wrong answer. We drive approx 10 minutes today, and walks will vary from 2-4 hours. Today’s a day for keeping cameras close and clicking fingers at the ready. Travelling along Western Australia’s answer to Victoria’s Great Ocean Road, you’ll be treated to superb views of sun-bleached boulders, turquoise seas and dramatic red-rock cliffs shaped by eons of crashing waves and rolling tides. 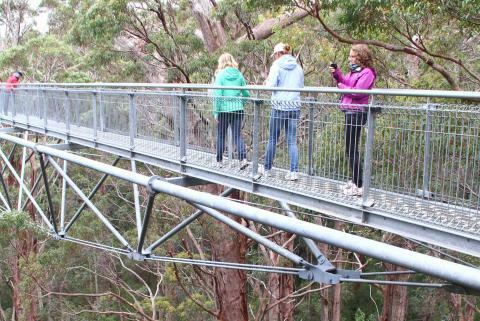 From the coast to the forest, we’ll veer off into the Valley of the Giants for a treetop canopy almost 60 metres above the ground. It is just over 5 hours from Lucky Bay to Sterling Ranges, with stops along the way. Diamond Tree, a 50-metre-tall Karri tree once used as a fire lookout, is our first stop for the day. With the handy assistance of a circular staircase attached to the tree’s trunk. Return to the coast for the drive into Margaret River, a region known for its local delicacies and world-class red wines. Cheers to that. Wake to the now-familiar warble of kookaburras and cockatoos before taking the coastal road. Today you'll enjoy a special Indigenous cultural experience – a bush walk with local Wadandi man Josh Whiteland, who is passionate about sharing his culture and bush lore with visitors. Learn how to identify bush tucker and medicine, discover the traditional arts of fire lighting and tool making, and enjoy a didgeridoo performance in the Ngiligi Caves. Afterwards, a final stint on the road will bring us into Perth. Although there are no formal activities planned it is usual for the group to get together and reflect on the big journey together over a few drinks and meal (at own expense). Today we drive approx. 5 hours (although driving through Perth city traffic can mean a slower journey than previously advised).